Germany, being a lot larger than Holland, has even comparatively more old trees. This is partly due to the much larger forested area, partly because Holland has large areas of open meadows without trees, partly because of differences in traditions. 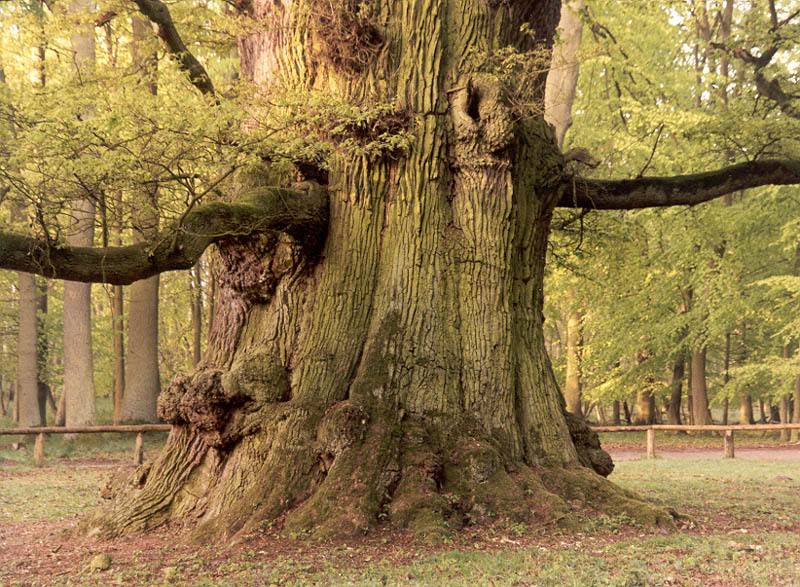 In Germany there are many big old oaks and lime-trees to be found in many parts of the country. 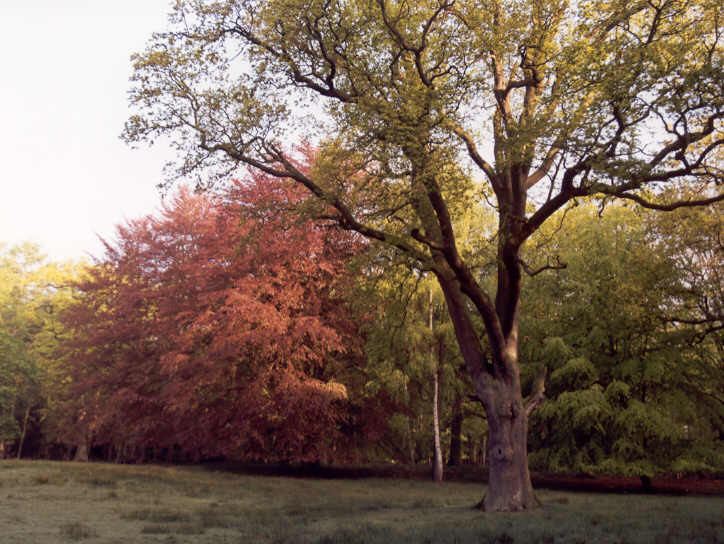 An outstanding area for trees is Mecklenburg-Vorpommern, in the north-east and formerly part of the GDR. In the beautiful rolling landscape with its many lakes and forests stand a lot age-old oaks, but also old village-lime-trees, heavy beeches and still several old elms. Ivenack is a small village in Mecklenburg-Vorpommern , near the towns of Stavenhagen and Neubrandenburg. It is situated in a beautiful rolling landscape on a small lake were the white-tailed eagle is breeding and has a nice Renaisance-Castle. The reason however that there arive busloads of tourists here can be found in the extraordinary group of ancient oaks in the neighbouring forest and deer-park. This is a remnant of an age-old grazed forest, in Germany called 'Hudewald' , wich had an open, park-like character and in wich free-standing oaks dominated, for wich reason they are also called " Eichenhain " , wich means open Oak-woodland. Till the 18th century there were many of such area's in Germany as well as great parts of Europe and Britain. After that this forest-grazing practice stopped, many of these oaks were cut or the forest became dense with shadow-tolerant trees like beech and hornbeam and the light-needing oaks disapeared. 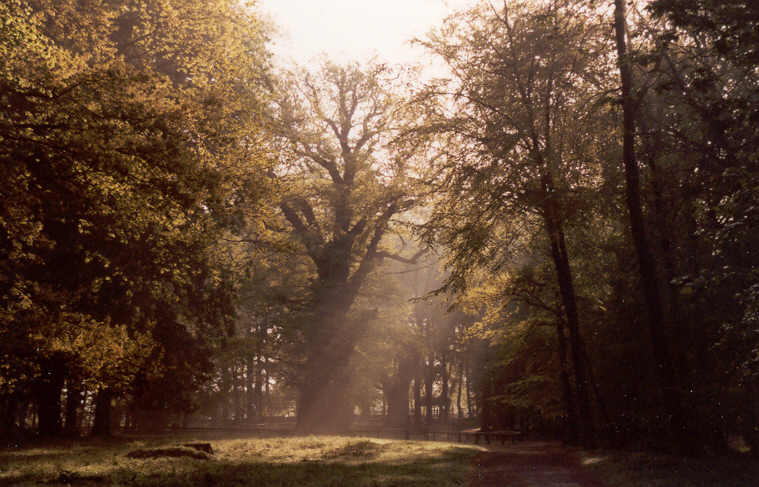 In Ivenack the old landscape was saved partly by creating a deer-park in the 18th century. 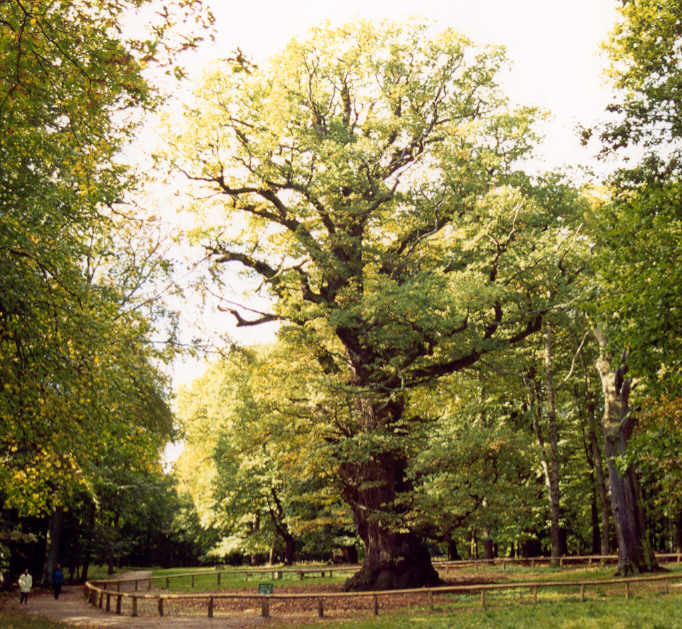 From the 19th century the oaks became famous because of their exceptional age and size. Around 1900 there were 11 ancient oaks left; now only 6 of them remain, but they belong to the oldest of Germany. Until recently it was thought that the oaks were between 600 and 1200 years old. Research on tree-rings from borings in 1996 made clear that the individual oaks are probably between 550 and 830 years old. (literature 1). Beside these 6 there are several oaks of 300 - 500 years in the park. These ages are impressive enough, probably there are not many older broadleaved trees in Europe. Near the entrance of the park are these two oaks, battered by age and threatened by fungi. Their age is estimated at 550 to 580 years. 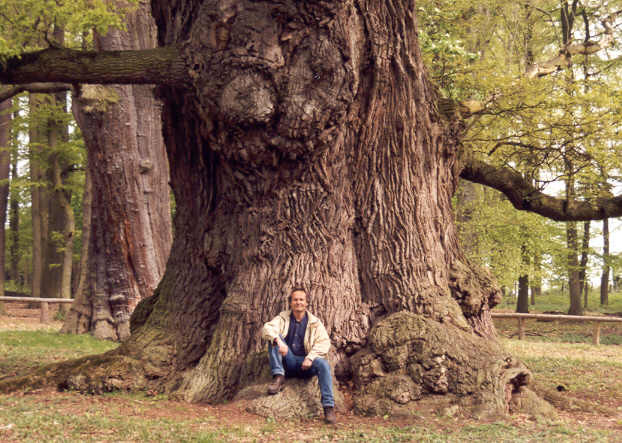 This is the biggest and oldest oak of Ivenack: this giant not only is the biggest oak of Germany, but perhaps the in volume largest as well as the most impressive living oak of Europe, including Britain. In the twentieth century perhaps only the tremendous Emperors Oak in Bosnia, former Jugoslavia, was larger all-over. Some figures: height 35,5 m (117 feet), crown spread 29 m ( 95 feet), circumference (at 1,3 m) 11,25 m ( 37 feet). At the sign in front of the tree the woodvolume is given as 180 m3 (6350 cubic feet)! Probably this is somewhat to much, but according to rough calculations by Jeroen Pater and me the total volume of trunk and branches will be something like 120 to 140 m3 (4237 to 5000 cubic feet). To compare: the famous American tree-measurer Robert (Bob) van Pelt estimated the volume of several large oaks in the UK recently. The largest volume had a Sessile Oak at Croft Castle, Herefordshire: around 3800 cubic feet or 107,6 cubic m. He estimated the volume of the famous Majesty the Fredville Oak in Kent as 3300 ft3 or 93,4 m3. 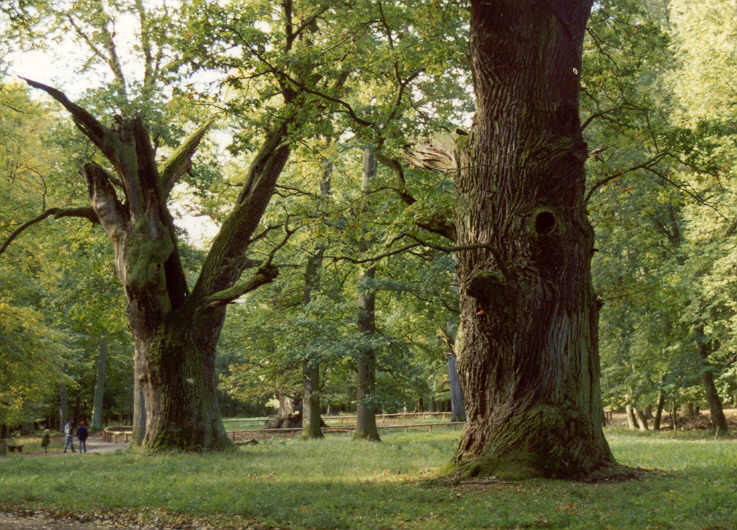 In Germany and Poland are some other oaks with a trunkvolume of around 80 to 90 m3 and a total volume aproaching 100 m3. Long was thought it was between 1000 and 1200 years old, but the recent research gives a probable age of at most 830 years. The oak still makes a healthy impression and has a totally sound trunk without holes in it: it cannot be seen if it is hollow. 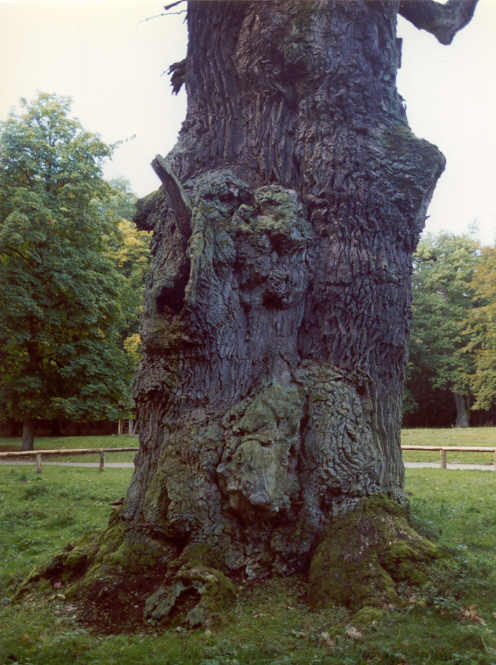 The tree differs from most very big oaks in Britain by not being a pollard: it has a trunk of over 15 meters length. # The famous and beautiful Wye Oak was blown over during a thunderstorm at june 6th 2002. The great Oak of Ivenack nearby. 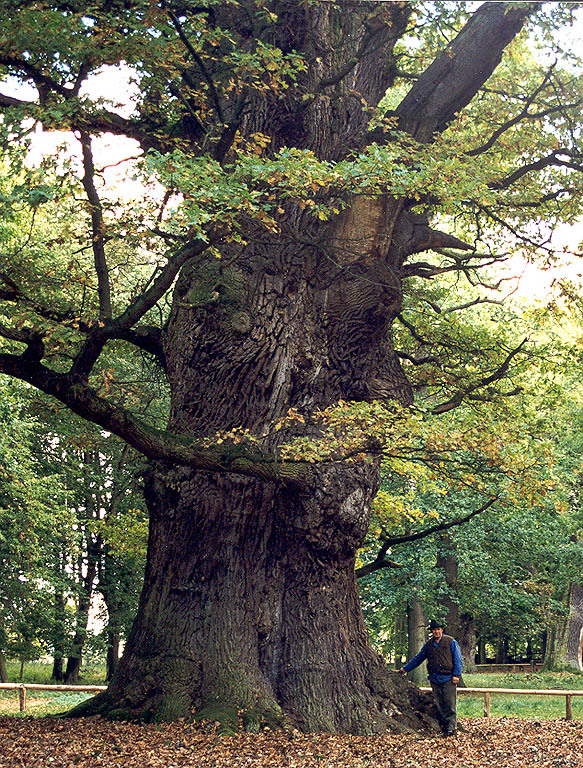 A German forrestor with the oak. Here you perhaps can see why it is my favorite among all trees! On the north face of the trunk the bark is less deep furrowed. 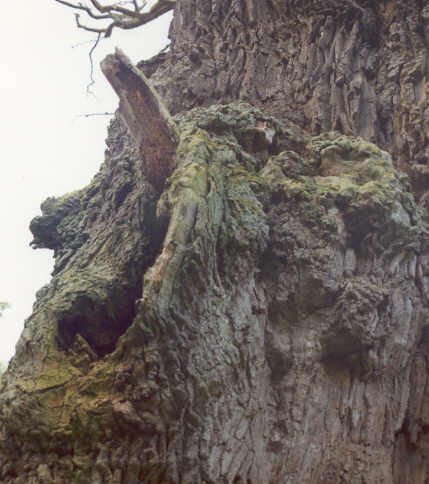 The so called Pferdekopf Eiche ( 'horse-head-oak' ) , wich is estimated nearly 700 years old, shows its age and looks to the visitor with many strange faces out of the trunk. It stands a few hundred yards from the largest oak. At the end of this visit a younger oak and a purple beech in Ivenack.